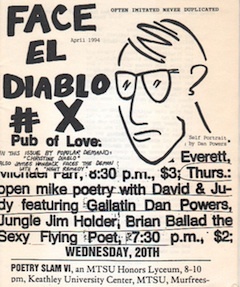 In 1994, a small Nashville literary journal titled Face the Demon became the very first journal to accept one of my works of short fiction, “Night Remedy,” for publication. I was still in college at the time and had recently written a small article about a related Nashville entertainment venue for the Middle Tennessee State University student newspaper Sidelines. By any standards, “Night Remedy” was far from a great work of literature. However, it’s always held a place of high esteem in my heart for being the first success of my many attempts to sell my short fiction. If I recall, my payment for “Night Remedy” was five contributor’s copies. I still have two of them.